As many of you have noticed there are two comics out right now that are practically the same sort of story. J. Michael Straczynski’s The Twelve and Alex Ross’ Project Superpowers are both are stories of World War II-era crime fighters brought from the 1940’s into the modern era. They both have characters with such names as Dynamic Man or The Fighting Yank, names that represent the new frontier that superhero comics had back in the Golden age but not seem kind of ridiculous. And finally, both seem to hint at something terrible on the edge of the horizon that only these heroes can stop. So what are the differences? Based off the first issues of these comics, I get the feeling that they both want to portray the same message: Heroes from the Golden age were more complex than readers thought and more deep than their writers made them. Many characters have twists applied to them, such as Rockman possibly being crazy or the Fighting Yank being obsessive and possibly a schizophrenic. Another similarity that both series have is how they set up the eventual big conflict in them. In The Twelve, the conflict seems to be more internal so far, with JMS focusing on the flaws each of his heroes have. On the other hand, in Ross’ Superpowers the conflict seems much grander in scale, as the heroes return to a somewhat dystopian world that’s drastically different from our own. Straczynski’s Twelve is set in the Marvel universe, using characters that were once owned by Marvel when it was the Timely comic book company. Each seems to represent some different type of superheroes as well. They have the Black Widow, a woman who seems to be the anti-hero of the group. They also have Captain Wonder, a patriotic superhero who represents the cleft-chinned macho man hero. 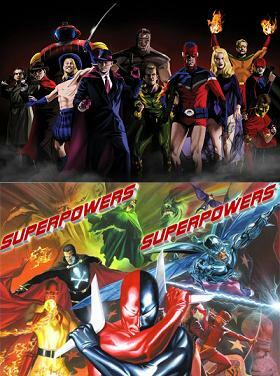 The twelve heroes seem to run the gambit on different types of powers, although Straczynski also appears to be pointing out how so many of them are similar; the Phantom Reporter and Mister E appear to be the exact same hero but with different color schemes and variations on their appearances. Project Superheroes is radically changing this theme though. Rather than setting them in a specific universe, Alex Ross is setting it in a universe of his own design, using characters that have lapsed into public domain. Many of the characters seem downright familiar; the Black Terror is here, along with a character that looks a lot like the Dan Garrick Blue Beetle but is called the Scarab. Ross clearly wanted to use these characters because they have such history to them, and he does not have to pay for them as they are public domain. It seems that both series have strong starts from their first issues but time will tell how these stories finish. Right now both series need to avoid as much overlap as possible or else they will end up blurring the lines between them. This entry was posted on Wednesday, February 13th, 2008 at 2:32 am and is filed under Commentary, Review. You can follow any responses to this entry through the RSS 2.0 feed. You can leave a response, or trackback from your own site.